This entry was posted in Portfolio and tagged AWDR.OL on November 14, 2013 by Alpha Vulture. I am invested in this one as well. At the end, this is a bet of oil price staying high beyond 2015. – Although the rigs are old, they will last at least 5-10 years. The management would not advertise with 20 yr life-time, if they weren’t sure of at least the short term. – UK market supply will remain tight. So, it is all about demand, which depends with a lag on the oil price. Yes, what the oil price will do beyond 2015 is obviously a big factor in the return. But what’s imo very important is that a large part of your investment is relative low risk: you get a lot of the money you put in Awilco back the next 2/3 years. And I think you don’t necessarily need the current high day rates to make money; it would be awesome if they stay at almost $400K/day, but if they drop to $250K/day like they did in 2009 things will probably still work out fine. This depends on what is the minimum rate of return that you target. With the current share price and minimum return of 20% / yr, Awilco is a good investment only if the high pricing continues after 2015. I am actually considering of selling. Awilco still makes money wtih 250. Obviously, if the supply exceeds demand, the price could also go much lower. 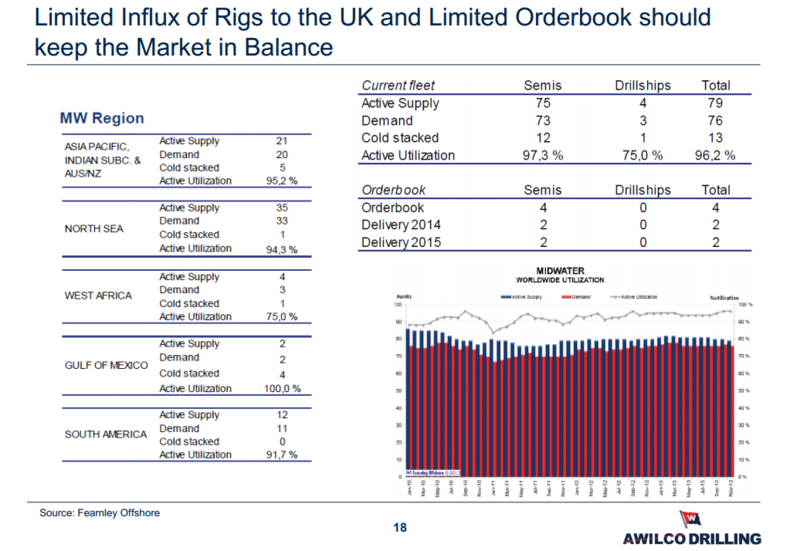 And there is still a residual chance that one of the rigs reached the end of life much sooner. E.g: the SPS in 2016 could uncover a big problem. I target a return lower than 20%, but I agree: Awilco is certainly getting more expensive. But I don’t think it’s at fair value yet: I think a yield between 12.5% and 15% or so would be reasonable. And holding something that does yield 20% makes this an investment were I’m happy to wait until it does indeed reach my fair value target: this is not one of those investments were time is your enemy. What kind of revenue efficiency do you expect in your model? It’s certainly going to be close if they can maintain $1/quarter or $1.1/quarter. Operating expenses are expected to go up, but revenue is also expected to go up while interest expense is going down. my calculations are similar (I also deduct a bit for the 3.5 month period which is currently only in options). Also G&A expenses of 12m, although in management projections, seems a bit optimistic, keeping in mind for 2013 it would be 30% higher. – 15m capex for BOP replacement will continue between 2014-2016. – so capex for next 3 years will be at least 30m annually. – then, if i understand correctly, on top of that one would charge 20m per rig for SPS in 2016 (on top of loss of 1/6 of revenue due to yard stays). – also would expect that going into 2017 and further capex would not drop to 15m annually as some otherr charges will most likely appear. 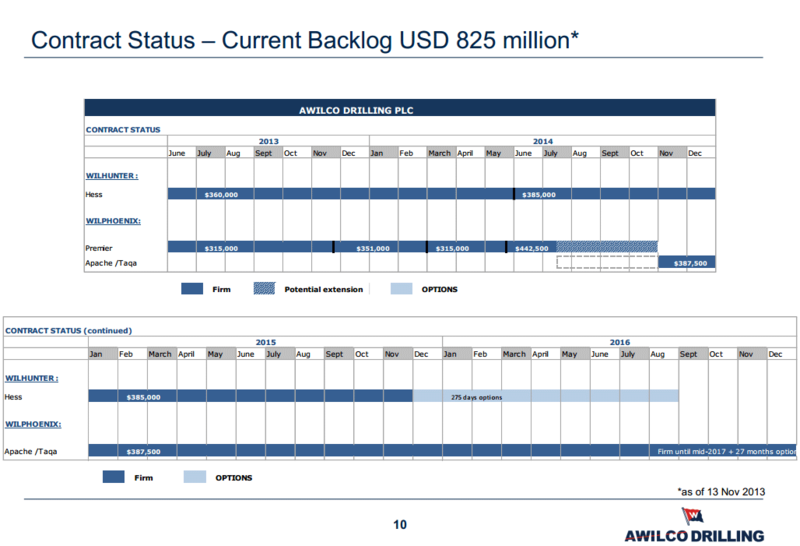 overall not questioning the Awilco’s ability to generate loads of cash, just thinking that this cash might not be enough for 120-130m annual dividend payments going forward. 1. My max revenue number is actually not the true max revenue, it already assumes that Premier doesn’t exercise the option to keep operating the rig after July. But note that this isn’t going to cause a couple of months downtime, if premier doesn’t exercise Apache wil start operating immediately (also visible in the first illustration of this blog post). If Premier keeps operating until October you would get ~5 million in additional cash flow. 2. The absolute minimum capex is not 15m; that’s almost the same as the depreciation, and this is an asset that should have little value left after 18 years (just some scrap value). Capex for the past 9 months is for example just 7 million while it was 3 million for the same period last year. Assuming 30 million in capex per year + 20m/rig for the SPS is just way too high. I think your OPEX is too high. 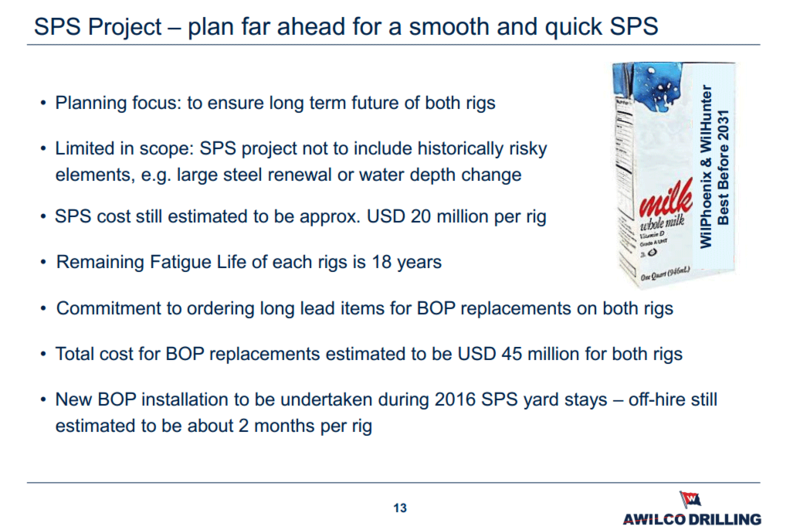 In the Q3 presentation Awilco estimates the 2014 OPEX to be $95K/day. So this being a total of $35m/year. Although this is substantially lower that OPEX in 2013 it clearly states expected OPEX to be $95k/day. So in your calculation this leaves $35M additional CF for the dividend distribution, making the $4.40 dividend achievable for 2014. Greeting from a fellow Dutch value investor. Yeah, pretty sure that 95K/day number is per rig.